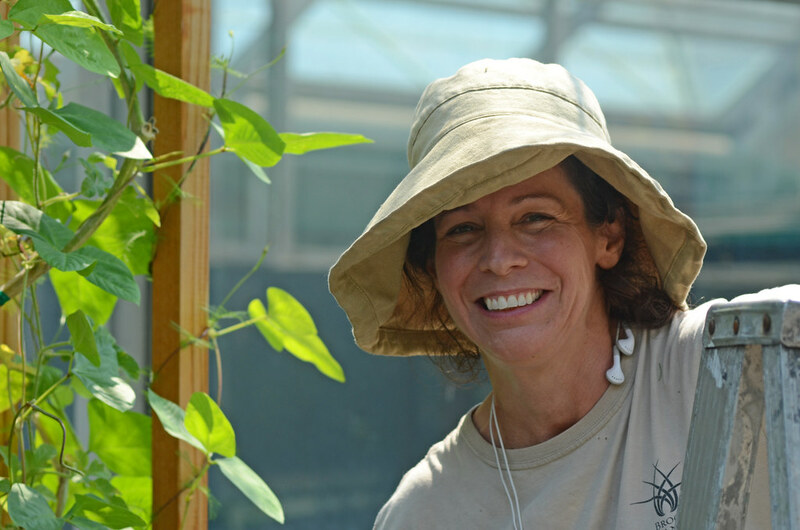 Karla Chandler’s public gardening career began at The Prospect Park Zoo where she was employed on the horticulture staff. In 1999 she began working at BBG as a gardener aide. She was promoted to gardener in 2001 and put in charge of the Warm temperate plants, which include an extensive South African Bulb Collection. She has made two trips to South Africa to study and explore the unique geophytes. In addition to her focus on creating a naturalistic and educational display she is interested in soil health and is incorporating compost teas and organic fertilizers in the Pavilion. She also designs and installs the four-season container display at BBG’s Terrace Café. Karla Chandler, curator of BBG's Helen Mattin Warm Temperate Pavilion, tending the Spencer Terrace. Photo by Jean-Marc Grambert.